TWO EPIC SAILING ADVENTURES - ONE AWESOME SAILING COMPANY! Mat and his team at Boom Sailing live and breathe sailing, it is in their DNA! Let the team take you in adventure out of Whitianga you will never forget! Whitianga is made for sailing, with a large sheltered bay, in fact the first Polynesian and European navigators Kupe and Cook both gravitated to Whitianga and the Mercury Bay. 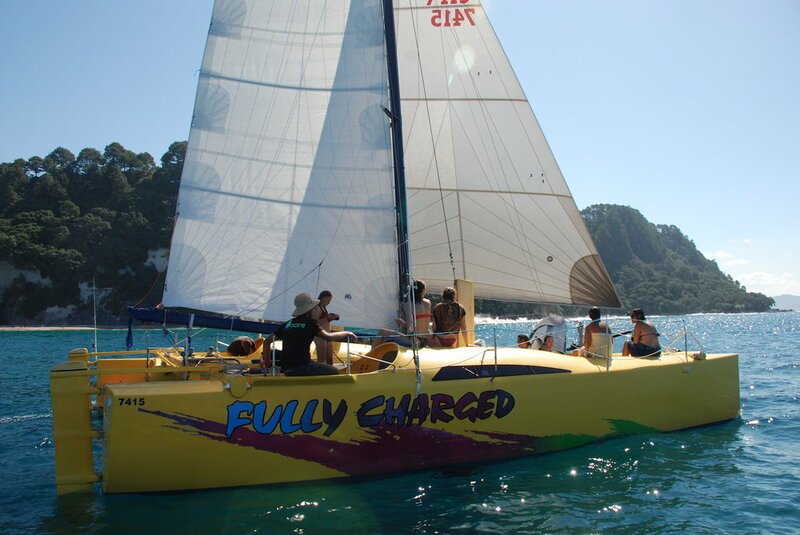 1) a chilled out morning or afternoon sail on Fully Charged, kicking back on the trampoline decks and bean bags while sipping back on a craft beer or wine, taking in the sights of Te Whanganui a Hei marine reserve, jumping in for a snorkel, and checking out the abundant marine life. Life doesn’t get much better! 2) an adrenaline packed sailing mission on a fully blown America’s Cup foiling Catamaran. In fact, the very ship that Team New Zealand first used to develop their foiling style sailing. You get to sail on a piece of America’s Cup history and have a mind blowing experience at the same time. Whether you want to jump on a sailing trip, morning, afternoon or sunset, or have a group that wants something special for a private charter or business trip, give Mat a call and talk to him about a Boom Sailing adventure today!